I’m saving my cash & doing it on the cheap. A free pattern & a bed sheet. An old duvet cover from Oxfam for £5 to be exact. I visualised it more as a swishy Stevie-Nicks-twirling-in-the-woods-kind-of-gypsy-dress out of this fabric, but the principal is just the same, and had just the friend in mind to make it for. MrsH is my oldest friend (I mean the friend I have had the longest… Since we were 11… 33 years! 😱). I pitched her my idea and, thankfully, she loved it. 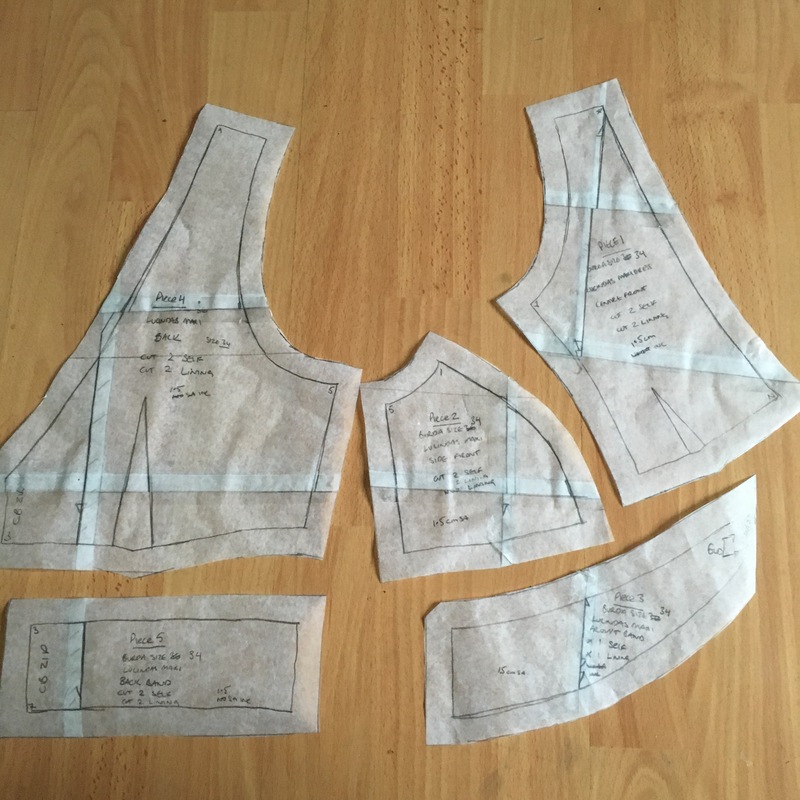 We don’t get to meet up often, so I got her to text me her measurements so I could make a mock up of the bodice. 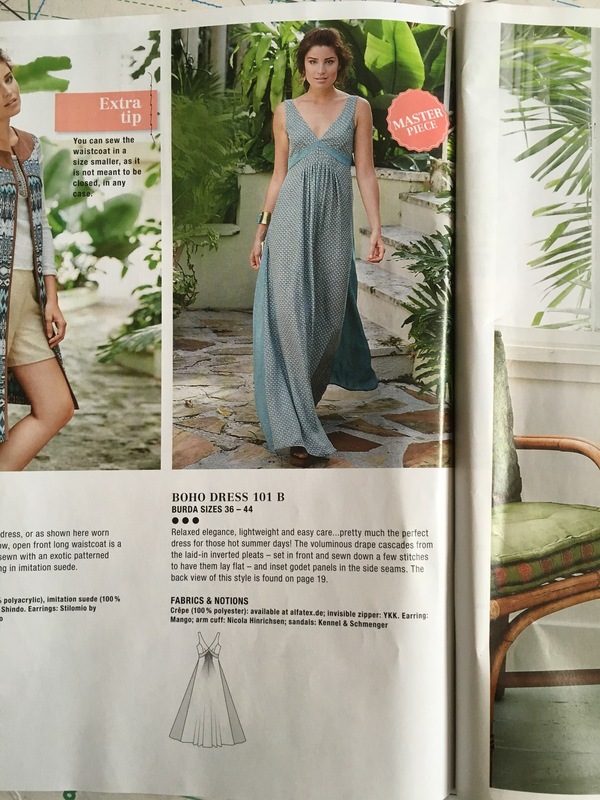 Her measurements matched up perfectly to the magazine size 34, brilliant, until I realised that this dress was the ONLY pattern in the magazine to start at size 36 not 34! 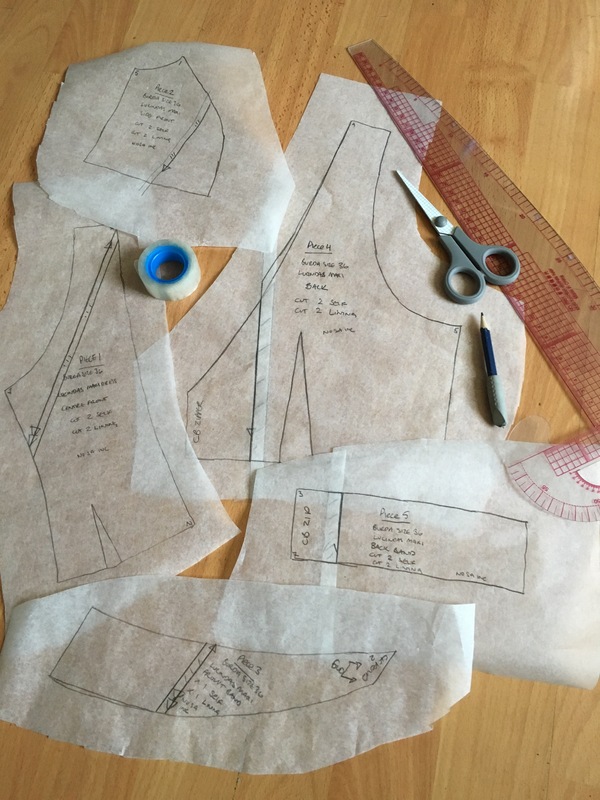 Delayed but undaunted, I looked up how to grade a pattern down a size. Turns out it’s not as hard as it sounds. 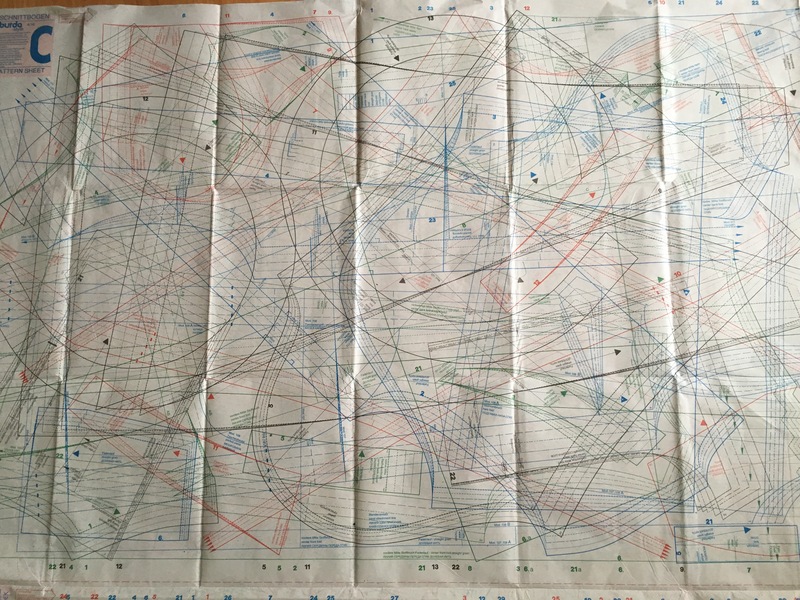 Basically I had to remove 4cm from the width of the pattern, divided and spread across all the pieces equally. As she’s short, I took the same 4cm from the length and hoped for the best. I made it up in an even cheaper bedsheet and waited until we next met so I could try it on her. 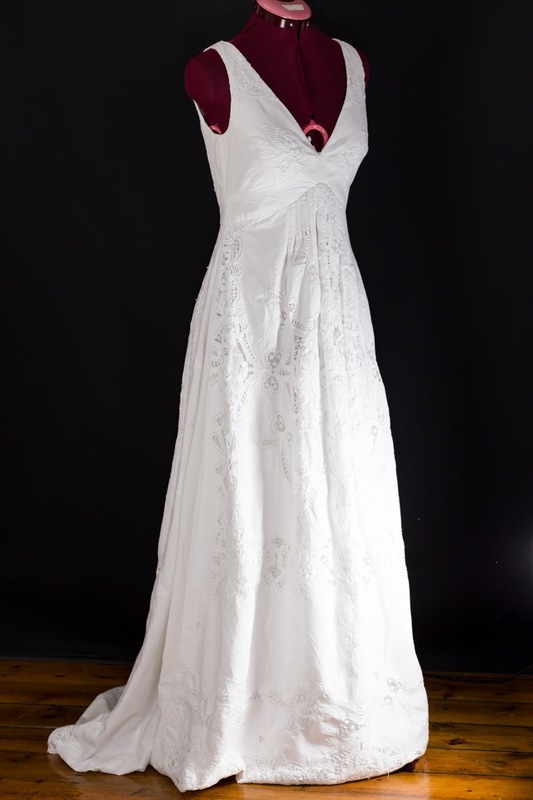 By the time we met, I’d lost the bodice & had to throw together another one in about 40 mins. We raised a few eyebrows when she tried it on in the corner of a pub in Liverpool Street, I don’t have any photos, but there’s a couple of guys in the pub who may have…? Turns out it fits my (borrowed) mannequin (Margot) about as badly as it fit MrsH. Looks like the 36 will do it after all. MrA’s professional label peeling skills were tested to the limit removing the sellotape from the pattern pieces for me. Respect. I’m glad I didn’t grade the skirt pieces yet. 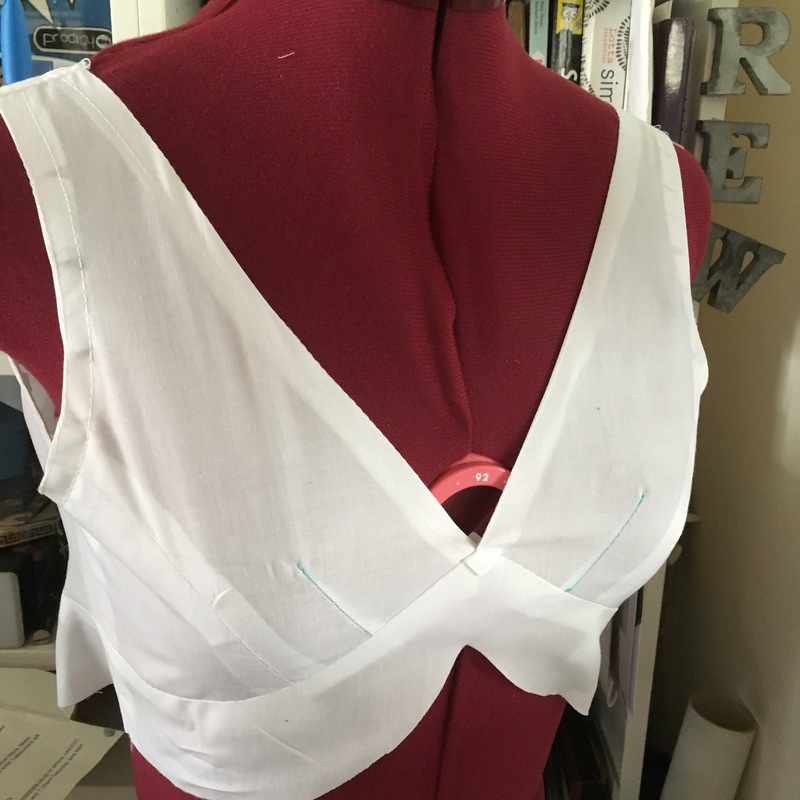 Construct the front and back bodice & lining. Turn the lining shoulder seams in and sew the lining front to bodice front and the back lining to the bodice back, and turn out. Genius! I’m sure this is done all the time in womenswear, but it’s the first time I’ve done it. My only approach was ‘blind faith’ and I’m pleased to say it worked! 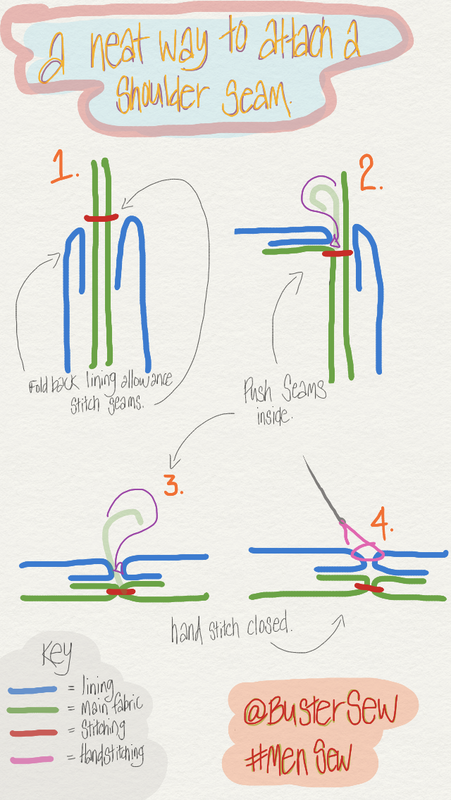 I’m wondering if this order of construction could be useful in making waistcoats… We’ll see. Closing up the side seams of the bodice & the lining in one go was the finishing touch to the top part of the dress. The skirt was massive. Easily the biggest pieces I’ve ever had to cut so far in my sewing adventure. I really had to clear the decks: the footstool went up on the sofa, the chairs got pushed back, coffee table into the bedroom… Clearance level 1. There was a bit of trouble at the outset when I realised that the embroidered sections were a totally different size to their ‘corresponding’ backing pieces. I ironed everything again and, thankfully, the embroidered bits were the right size. I re-pinned, re-cut the backing and basted it together along the rogue edges. It was my own fault for not ironing it properly in the first place. Lesson learnt. I’ve not done pleats before, not like this anyway. It said “Working from the wrong side” So I pinched them in to the back, pressed them up to the middle and hoped for the best as I stitched them down. Then I joined the fronts & backs with the godets. Now it was time to join the skirt to the bodice. I’ve made quite a few girls dresses lately so this shouldn’t have been a problem. I felt quite daunted though. I think the size & weight of the skirt compared to the small flimsy-ness of the bodice threw me off. Having all that weight of fabric on my lap reminded me of my quilt making escapade. So I bundled it back into a carrier bag ready to finish. The next day (with a slightly fuzzy head from the party) I put in the zip & stitched down the lining. From now on I think I’ll always insert invisible zips when I’m hungover… it’s my best to date. 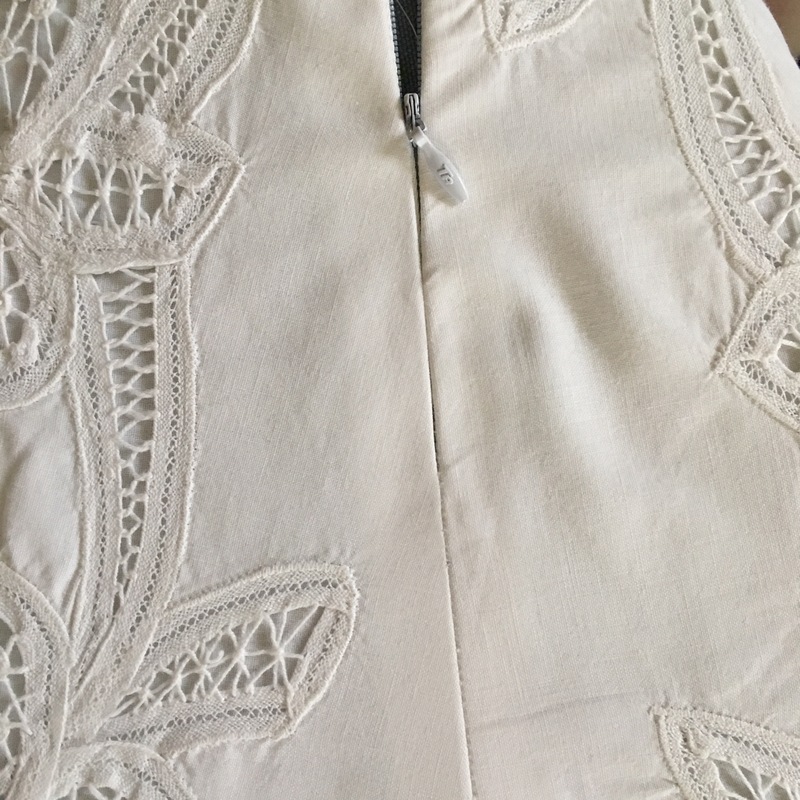 I press the seam allowance, then mark on the top & bottom of the zip, transfer those marks to the dress then pin the zip in place using the markings. Once the Zips in, I sew up the rest of the seam. The hem will have to wait until we are not at a party. There’s enough length to make a little train, although it has come out quite wedding-y already. And trains can get mucky… I suppose it doesn’t matter if it gets filthy as the whole thing can go on a boil wash. It is bedding after all. I’ve been stalled in the posting of this blog; MrA insisted I get some better photos before posting it. I agreed, so arranged another photo session at PhotoBob’s (my photography friend) in lieu of getting MrsH into it. 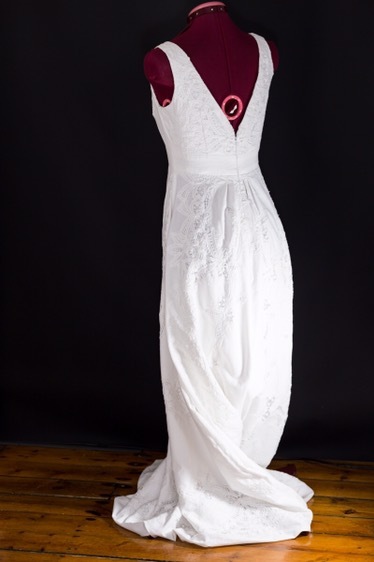 So, in the meantime, I present to you, the (almost finished) Bed-Sheet-Ball-Gown! Of course, it still needs hemming, I’m sure I’ll get around to that by the time it’s summer again & MrsH can wear it. I really enjoyed making it. I think the biggest challenge was handling the giant pattern pieces in my teeny tiny flat; I dream of having a designated sewing room, with a big table & lots of space. Maybe one day. Maybe. Don’t be put off by large pattern pieces. Remember construction details and utilise elsewhere. Be patient; wait for nice pictures. I happened upon your page via Bloglovin. Just snooping around and found this article. ( Yes I know it is over a year old.) Love it!!! I started sewing when I was 5 yrs. of age. 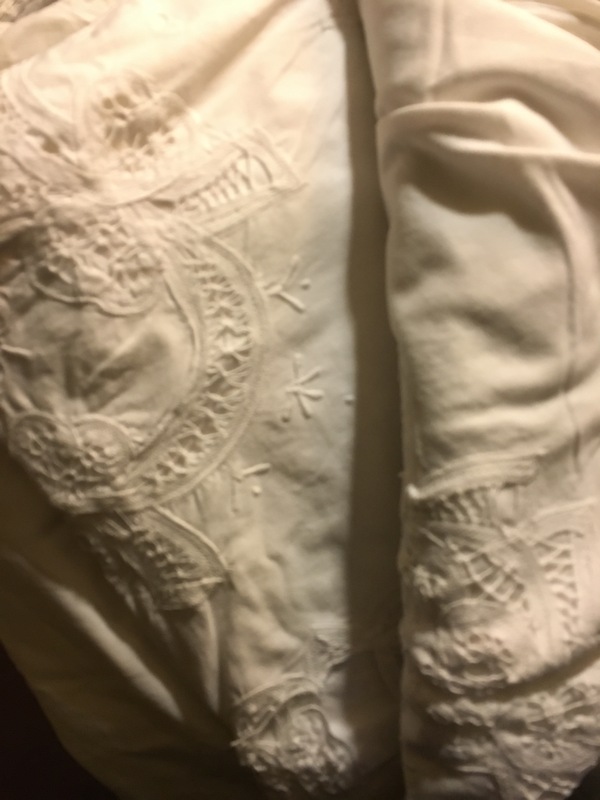 My Austrian Grandmother taught me—she was a seamstress. 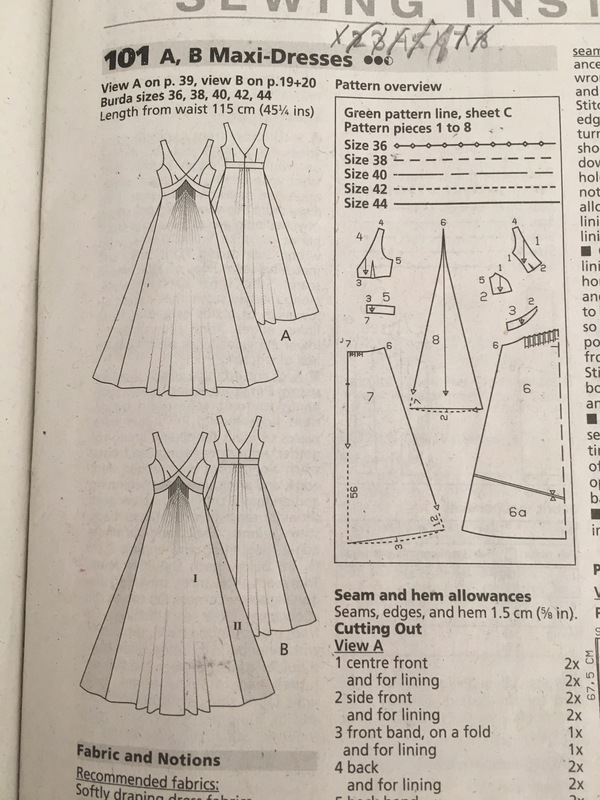 I grew up with Burda magazine patterns. As a 20 something I inherited a slew of linen beds sheets from my great, great aunt. Some with Battenberg lace some with my initials-we had the same minus the “K”. I did what you did-made garments long before internet. 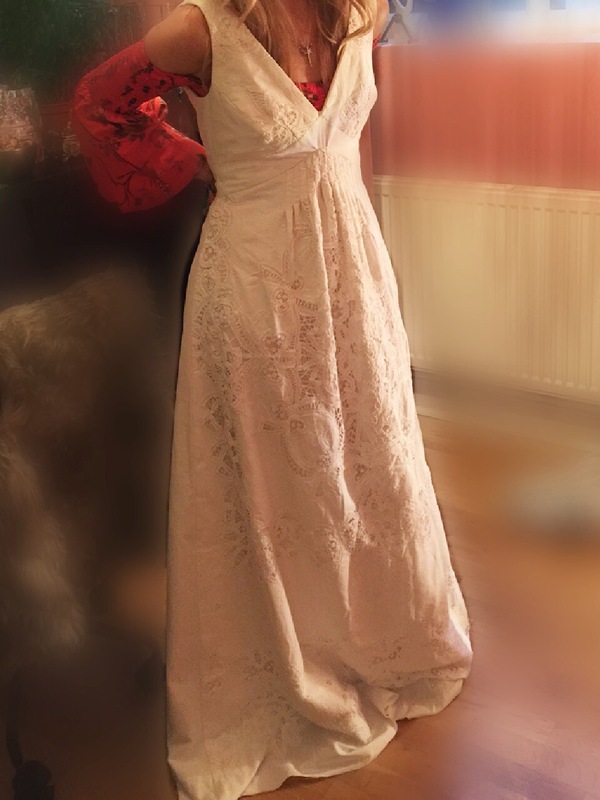 I even died some to make a dress and cropped jacket for my brother’s wedding. Pictures I may have had (we’re talking 30 yrs. ago) are long gone and definitely not digital. 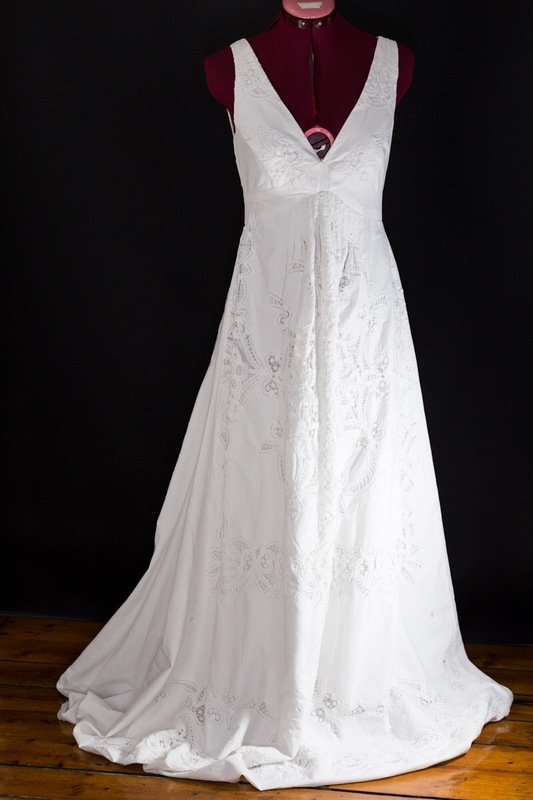 This dress you made is simply stunning and reminds me of some of my favourite sews. Beautiful! What a wonderful story, thank you so much for sharing it. I really enjoyed making this & would have loved to see some of your creations. I love a good sheet-transformation! What a great way to use a duvet cover. It looks great. Refashion into glamorous fashion. Awesome! And fab bedding to begin with. Thank you! 👍🙏 it would have been lovely to have saved it but it was pretty raggy in parts! Then you found the perfect transformation for it!